Whether it is winter of just a cold damp day it is not an excuse not to get out on your bike. By carrying these 10 essentials, you can enjoy riding on your own, or with friends, throughout the entirety of the colder months. Something to keep you warm, but that won’t make you sweat – It might be tempting to dig out all of your winter woollies and waterproofs before heading out on a cycle at this time of year. But you must take into account that these could make you sweaty and uncomfortable during your ride. Be sure to use cycle-specific clothing, as garments suited to other sports may not have the correct fit or be the right material for riding in.If you’re unsure whether or not you have the right amount of layers on, head outside before your ride to make sure. Remember that you’ll be soon warming up when you begin to pedal. Something to fix punctures – In cold, wet weather conditions your bike is more likely to get a puncture. As soon as the road surface is wet, it becomes a hotbed for sharp objects and glass, which will cut right through your tires. Ensure that you are carrying at least two tubes and a working pump, even if you’re riding with a group. Something to sip on – You may already feel a bit waterlogged from riding outside in the winter, but staying hydrated is very important. You’ll still be losing a lot of sweat, even if you feel cold, so it’s vital that you keep drinking regularly. Take a bottle of water with you, and on longer rides you can always take a flask of warm water to ward off the chill. If you’re with friends, why not stop off at a cafe and treat yourselves to a delicious hot drink? Just be sure not to cool off too much when you are stationary. Something to nibble on – Likewise, it’s imperative that you take a snack or two along with you , as well as eating something nutritious before you hop on the bike. Store energy bars somewhere warm, where they won’t get hard during your cycle. Something to keep you safe – Even during the day at this time of year, the visibility on the road can be extremely low, so be sure to turn your lights on when it’s cloudy and foggy. This will ensure that other riders and vehicles on the road can see you and that you don’t get knocked off. It may also be a good idea to carry spare batteries, or ensure that your lights are freshly charged before every ride. Something to protect you from the mud – Mudguards are a must for winter riders. Who wants to be covered in mud during an already cold ride? And, trust us you definitely don’t want to be riding behind someone without mudguards! Something to get you through the ride – Opt for tyres that have a good grip and are hard wearing, to avoid countless punctures or slips. Choose tyres that are wider than your usual ones to make sure that you have more stability whilst out on the road. A hard wearing bike – If you get the winter cycling bug, you could also invest in a specific bike for the season. Often these bikes are kitted out with inexpensive parts that are easily replaceable, mudguards, wider hard wearing tires and lights. Another idea is to keep your old bike if you buy a new one and fit it out yourself with these parts. Something to protect your head – Regardless of what time of year it is, you should be wearing safety gear and a helmet. Again, wintertime brings with it wet and slippery road surfaces, so it’s crucial that you stay safe by protecting your body and head. Something to allow you to stay indoors – OK, this articles is about NOT making excuses, but sometimes the weather really is too bad or dangerous. 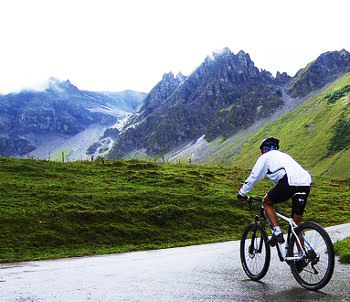 If you cannot get outside then you will want a turbo trainer. Simply connect it to your outdoor bike and train in the comfort of your own home! 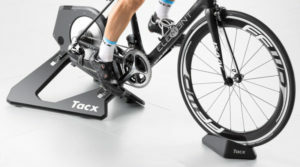 If you want the best of the best then you will want a Wahoo Kickr or a Tacx Neo. Read more about these here. There are lots more choices however the suit all types of riders. Check out our turbo trainer guide here.